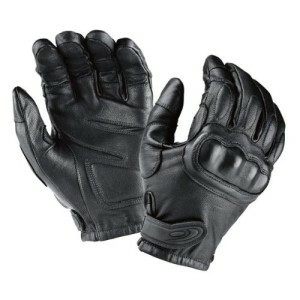 Designed by a specialist company, these Tactical leather gloves are made for the American military and Special Forces. They’ve got all the features you would expect on a biking glove including a hard knuckle protector, extra leather on the inside of the hand and padding on the palm. These gloves are made from leather and features a band of leather that goes round the end of the index finger providing extra protection and a snap fastening at the wrist. The Tactical leather gloves are superbly put together to the highest military specification, however don’t go expecting much in the way of waterproofing as these are summer only gloves.Made from leather.